AmmoSeek.com lists ammunition, reloading supplies (bullets, brass, primers, powder, reloading_misc), magazines, and guns. The feed must be real-time or updated at least every 5 minutes. The feed should include only in-stock/available products. The feed should contain (in each record) an indicator of the product type the record contains. Detailed feed specifications can be found here . 3. Save the trial key. 4. 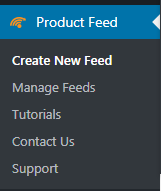 Go to ‘Create New Feed’ option on plugin menu. 5. 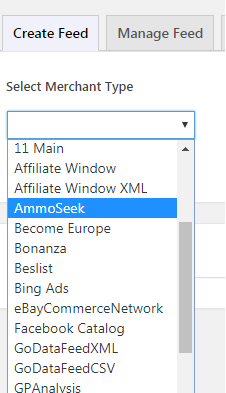 Select AmmoSeek from “Select Merchant” drop down. 8. Choose your Woocommerce product category to include in WooCommerce to Ammoseek product feed. 9. Select the appropriate Product Type in Category name, a list will appear, select one from the list. 10. Give a name to the product feed file you create for AmmoSeek merchant. 12. Click on ‘View Feed”. You will get a feed in a new tab of the browser. As you develop your feed, you can use AmmoSeek’s Feed Tester to verify that things look correct. Once your feed is ready and you think it meets all required criteria, submit it to Ammoseek for review using the form.